Guanciale Cured Hog Jowl from La Quercia for sale. Buy online at Zingerman's Mail Order. Gourmet Gifts. Food Gifts. Cured hog jowl from La Quercia. 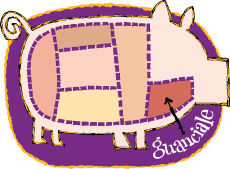 Guanciale comes from the jowls of the pig, and while the Italian word guancia means cheek, guanciale, in a very Italian turn of phrase, means "pillow." So think of this as a pork pillow. It's cured similarly to bacon, but it's not smoked. It has an Italian flair: a bit of rosemary is included. With more fat than pancetta, it’s intense, indulgent stuff and greatly magnifies the flavor of your dishes. Slice off a few chunks, and toss them into a pan with root vegetables like potatoes or squash. Give your sauces a boost with a few pieces in the pot. Get creative. Guanciale rewards the adventurous cook. Herb and Kathy Eckhouse make this guanciale at their firm, La Quercia, in Norwalk, Iowa, one of the best sources for great Italian-style cured meat, either here or in Italy. As with all of their meats, Herb and Kathy make their guanciale with pork from pigs raised naturally, without hormones or sub-therapeutic antibiotics. Acorn Edition Tamworth Guanciale is made from Tamworth breed hogs that spend the last few months of their lives rooting in the woods and chowing down on as many acorns as they can get their snouts on. The guanciale is even richer, fattier than the standard guanciale due to the affect the acorn diet has on the pigs. "I like the idea of snuggling up with a pork jowl pillow." Guanciale is "the savory-leaning palate’s equivalent to white chocolate."